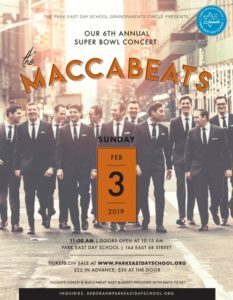 Rabbi Arthur Schneier Park East Day School presents The Maccabeats The 6th annual Super Bowl Sunday Concert Sunday, February 3, 2018 11:00 am Tickets $20 in advance $36 at the door Each ticket includes tailgate lunch & Maccabeat meet-and-greet! Click here to purchase! Park East Grandparents Circle presents its 6th Annual Super Bowl Sunday Concert! THE MACCABEATS Sunday, February 3, 2019- 11 am $25 in advance - $36 at the door Tailgate lunch included CLICK HERE TO PURCHASE TICKETS OR FOR SPONSORSHIP OPPORTUNITIES!